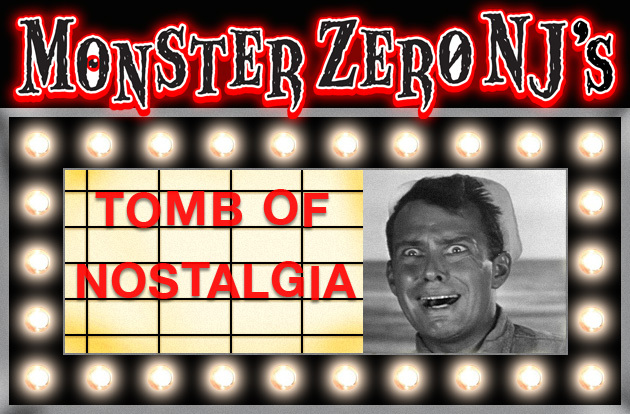 Having recently watched and really enjoyed the 2013 remake of this 1980 cult classic, I thought I’d revisit the original and see how it holds up. I’ll be honest, I never really liked this slasher flick much and upon watching it again, my opinion hasn’t changed. 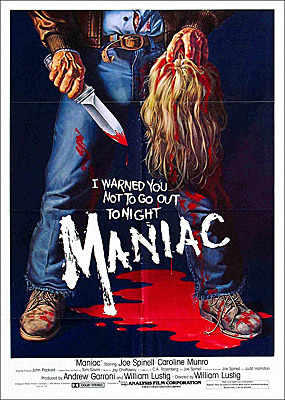 Maniac is an ultra-gory slasher about the mentally disturbed Frank Zito (Joe Spinell who wrote the story and co-wrote the script. ), a man who likes to slaughter and scalp young women and then dress up mannequins to resemble his victims, scalp and all. He was abused by his now dead prostitute mother and he has quite bi-polar feelings about women as a result. The deranged Frank is carving his way through NYC’s nightlife when he encounters beautiful fashion photographer, Anna (Caroline Munro). Frank falls for Anna, but can he keep his scalpel in his pants or will Anna join the mannequin of the month club? As directed by William Lustig, Maniac is a sleazy horror that would fit perfectly in the Time Square grind houses it was made for. It seems more like an excuse to gorily dispatch young woman and their dates, if they aren’t alone, than an actual attempt to make a good thriller. Spinell’s scenes of talking to his mannequins and crying about what he’s just done to the latest victim come across as more silly than scary or disturbing. Spinell, a New York native who passed away suddenly in 1989, made a career of playing sleazy street thugs and gangsters, but doesn’t have the range to really make these scenes work and they just induce giggles. Though, it does add a bit of a camp factor I must admit. The film itself is slow moving and there is no tension or suspense as the victims are basically just that, fodder for Frank’s arsenal of weapons. They are dispatched soon or immediately after we meet them and there is no emotional investment in them and their fates are obvious from the minute they appear. The film is really most famous for some of make-up FX master Tom Savini’s best gore effects, used in the victims’ deaths. The scalpings, stabbings and shootings all are quite realistic and disgusting and any effectiveness the film carries is from his work. He even got to shoot himself as he plays a young victim’s date who has his head shotgunned to pieces by Zito. The catch is that Savini was also a stuntman and doubled for Spinell by jumping up on the car hood and shooting his own character in the face. Savini’s work here was considered quite shocking and got Maniac released unrated. His FX still hold up today, though the rest of the film really doesn’t. My final gripe is that I don’t believe for one minute that Munro’s beautiful photographer would actually date a guy like Spinell’s Zito. Aside from the fact that he is just sleazy looking with his long greasy hair and pot marked face, more importantly, he just acts weird and the fact that he tracked her down to find her, should set her internal creep alarms off immediately. He basically stalks her and she agrees to go out with him after a strange conversation that should have any woman on her guard. Also, they don’t finally meet till the last act and their ‘relationship’ is never given time to develop to the point of believability. If it was given more time, maybe we could see Frank overcome the creep factor and win her over. Based on what little we do see, it doesn’t work. If they didn’t date, though, the movie wouldn’t go anywhere and technically, it doesn’t. Predictably, cuckoo Frank can’t help but emerge when taking Anna to visit his mother’s grave (which should have been another sign, Frankie is a tad off), which sends the movie to it’s gory and somewhat abrupt conclusion. All in all, I recognize Maniac’s place as a cult classic 80s slasher, but Tom Savini’s masterful FX aside, I think it’s reputation far exceeds it’s actual merit.